Playful, romantic and charming, Delighted is like a perfect date. 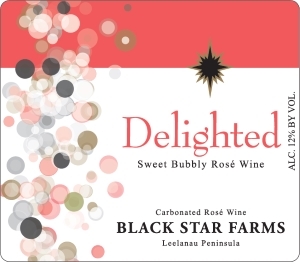 It is a fun and festive sparkling wine meant for many different ocassions but is also just right for date night. Flavor and Aroma: Flavors of red berries are complemented by a sweet lush fruity finish. Enjoy this wine with grilled white meats and seafood, mild cheeses and fruit based desserts. Delighted was created to be easy on the palate and enjoyable for many. Made from Frontenac Gris, this wine showcases the fruity nature of this grape varietal while maintaining a freshness that is just right for a bubbly. Pop open a bottle on your next celebratory occasion or simply when you are looking to enhance an ordinary day. From JBerk of Dearborn, Michigan on 6/20/2017 . 10/1/2018 – I see you're sold out again. Popular stuff. When will there be more available? 12/22/2017 – Is delighted sold in any stores in Detroit? Response From Black Star Farms: It is not. The Delighted is only available in our Traverse City area tasting rooms. 12/9/2017 – When will Delighted be available to purchase? 12/6/2017 – When will you be getting more?